My I AM Presence - Who is Mother Mary? Mother Mary is the archeia of the fifth ray and twin flame of Archangel Raphael. 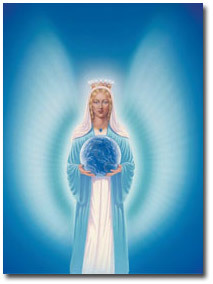 Although an archangel, Mary has also taken physical embodiment. In the early days of Atlantis, she served in the Healing Temple, tended the flame and studied the healing arts and disciplines necessary for precipitation. At that time, she developed great concentration and consecration to the immaculate concept. The purity of her heart flame and her devotion shone upon her face was evident to all who frequented that Temple, she remained a temple virgin during that entire embodiment. In her final embodiment, Mary came forth under the direction of hierarchy, chosen of God to bear Jesus the Christ, who would demonstrate the laws of alchemy and the victory that every man must attain over sin, sickness and death.